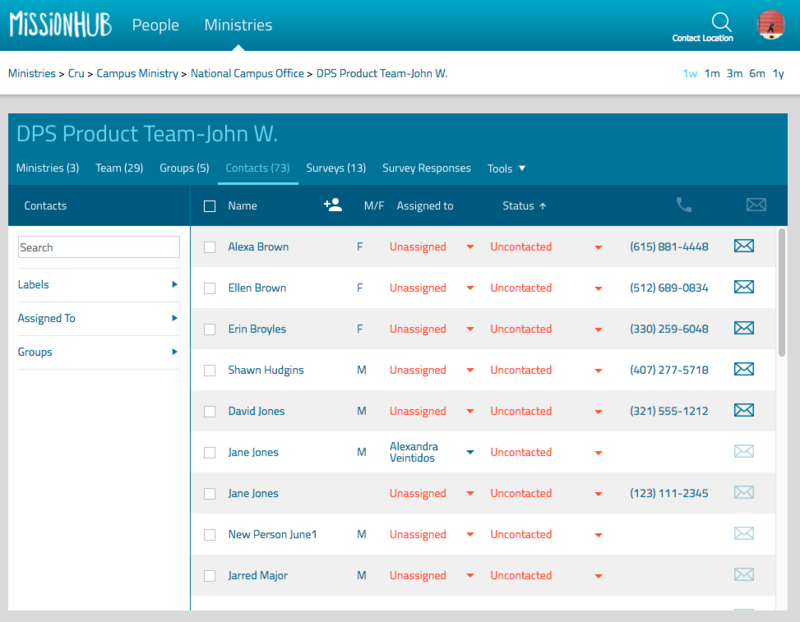 The moment you sign in to MissionHub, you’ll see all of your people in one place, even if you are in multiple ministries. 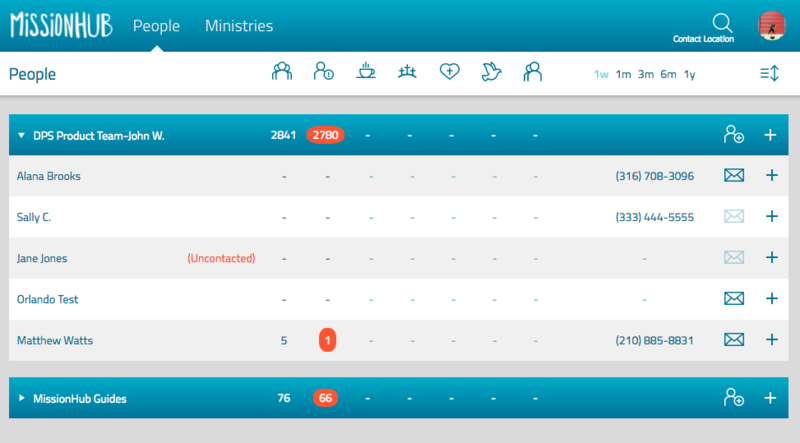 There's lots more on your dashboard too, like aggregated details of people and ministries, alerts for uncontacted people, as well as quickly adding a contact to your ministry. You can also quickly add an interaction and note, right from the home screen. From the dashboard you will be able to rearrange the order or hide your ministries. By selecting the eye, you can hide a ministry - you can always come back and reveal it again as needed. You can rearrange the order by selecting the box on the right. Your mobile app experience will show up however you have it customized here. To add a contact from the dashboard, locate the appropriate organization and select the add a contact icon in the ministry bar. Here, you will be able to add any contact information you have for them, update their permission, and/or add answers to specific surveys. When you’re done, be sure to save the contact. This person will be assigned to you. From the dashboard you’ll be able to see a quick view of ministry activity over a specific amount of time, which you can select in the menu. From left to right, you’ll see the number of contacts in the organization, the number of uncontacted contacts, then specific interaction types (spiritual conversation, personal evangelism, personal evangelism decision, holy spirit conversation, and discipleship meeting). You can quickly add an interaction and note, as well as archive right from the home screen. After a meeting with someone, find their name on the dashboard and click on the + to the right of the their name; this will open an interaction drawer. Select the interaction you would like to record, add a note if you want, and select Done. 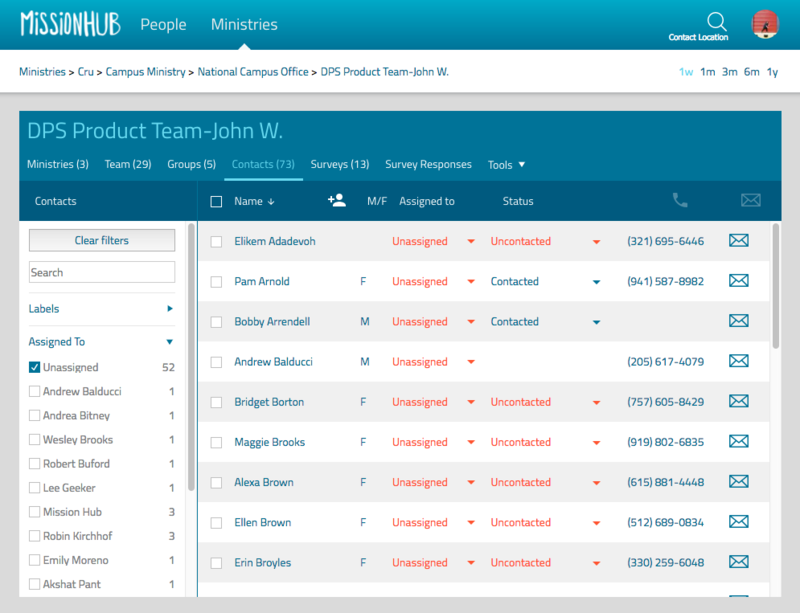 The number of unassigned contacts in your organization will appear as a notification bar under the ministry name. If you would like to assign these contacts to people on your team, click on the name of this ministry. 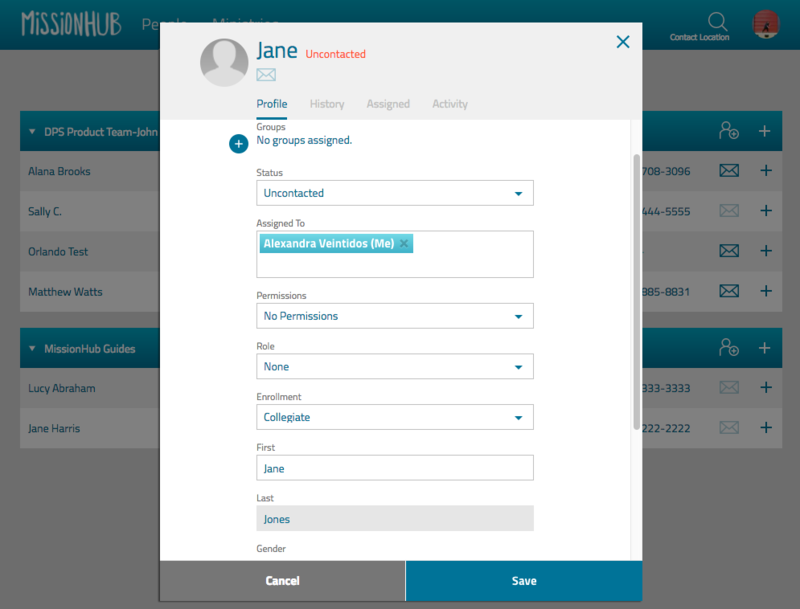 Then you'll be able to filter by unassigned and assign in bulk as needed under the Contacts tab. You’ll also see the number of uncontacted people when you first log in. These are contacts that have no interactions or status recorded. You will be able to sort all of the uncontacted people under the Contacts tab in the ministry view. This will also let you know if any uncontacted contacts still need to be assigned.